One of many drunken nights ago in a University bar I got into a vicious competition over Boyzone’s version of this song. My table would put the Boyzone song on the jukebox. Another bunch of drinkers at the next table would reply with Weezer’s “Buddy Holly”. This went through six or seven cycles before we were all threatened with eviction – remarkable patience by the bar staff, considering. Now I’ll admit our first play of the track was probably a tiny bit “ironic”. But as we played it again and again, evolving a complex series of arm-dances to accompany it, and as the drink fogged our brains, irony dissolved into territorial love. I wouldn’t now spend money – even 20p a shot – to hear Boyzone’s “Love Me For A Reason”, and I wouldn’t go to bat for it critically either (except relative to that dreadful Weezer song of course), but it’s left me with a dogged fondness for the song, which even in this much finer original formulation was pretty clockwork stuff. The endlessly repeated chorus has a lulling quality – FUN girl, ONE girl, REASON, LOVE – and “Love me for a reason and let the reason be love” is one of those sublimely banal aphorisms only a boy band can really get away with. 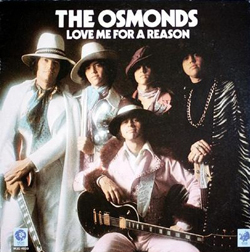 The Osmonds do a professional job on the tune, though, and when they wriggle out of the chorus straitjacket there are some quality pop moments: most of all, the lead-in to the final chorus – “my initial reaction is – honey gimme love, not a facsimile of!” – where the words cram into a gabble of excitement that breaks gloriously through the choreographed cooing. #58 thru #60. Speedwell, great observation, great question. I am sure you know why I am drawn into responding. 2 big answers strike me. However, for 2 different reasons, neither is a patch on the amazing case of the Osmonds. Cliff Richard’s US 6 track would be “Devil Woman”, “We Don’t Talk Anymore”, “Dreaming”, “A Little In Love”, “Daddy’s Home” and “It’s All In The Game”. In the UK – pick 6 number ones – 5 of the above didn’t make #1: We Don’t Talk Anymore is one of the top 6 in the UK on the tiebreaker of weeks at #1. Cliff’s peak in the UK was 20 years apart from his peak in the US. Similarly, Elton John – if we exclude collaborations with other charting acts. A few US #1s in the 70s; biggest UK hits dotted across the decades, from “Rocket Man” to “Are You Ready For Love?”. “Candle In The Wind 97” the only one to make it to #1 in both countries. HTGH you might know this… any idea how Billboard choose/chose their chart return shops? I’m wondering how country and R&B hits were more or less excluded from their pop charts prior to the mid/late 50s. As for divided US/UK greatest hits, solo Donny shares only 2 transatlantic greatest hits, Puppy Love (US #3) and The Twelfth Of Never (US #8). Go Away Little Girl was his only US #1. @Wichita. Was just watching a bonkers, schlock/horror film, Horrors of the Black Museum (1959) (it’s on youtube). It begins with a 13 minute rant from a hypnotist trying to hypnotize the audience (the film itself says it’s presented in Hypno-scope). Anyhow, the hypnotist’s closing gambit is ‘…You are in London. A part of that strange, weird, ancient city. You are part of London…’ May be too obvious for you, but just in case you’d want to check it out with an ear to a sample I thought I’d give you a heads up. I should really call a stop to this but…. hardtogethits – I did briefly look at Elton John knowing of his US ’70s No1s. From ’79-90 in the UK it was pretty much 50:50 whether his singles made the top 40 or not, which I think is amazing. It wasn’t like it a was a quiet time for him either with 30+ releases. There are two clips posted by LondonLee in “Crying All The Way To The Chip Shop” of Saint Etienne playing in the US a couple of days ago; looks great! #63 I dearly wish I knew the answer to your question. I don’t. The purpose of the Top 100 (introduced 1955) and Hot 100 (1958) was to ensure all types of music were included, but that just backs up the observation which prompted the question, rather than providing an answer. Not much use, really. Sorry. Thanks HTGH. If that’s why they were set up, it at least acknowledges there was a problem. And thanks Swan, I’ll look it up! Firstly – don’t stop the thread, Speedwell. We should at least stay here until the landlord notices we’re only drinking pop (or that we’re waiting ’til he starts asking questions for prizes). Secondly, Got another for the ‘1 in 6’ club: Fleetwood Mac. UK: Albatross 1, Man Of The World 2, Oh Well 2, Everywhere 4, Little Lies 5, Tusk 6. Thirdly, whilst at work today OMD’s “If You Leave” popped into my head, a propos of nothing. “Ha!” I thought, “They’re shoo-ins for the Big Disparity Between UK and US Chart Careers Club.” Unfortunately, this isn’t true as apparently they only had 4 US Hot 100 hits. But even though those four were Top 30 hits in the US, none of them reached the Top 10 in the UK – where they had 7 (seven) (remember the days of the teleprinter) Top 10 hits. Firstly, I’m running out of thoughts on that particular thread, though I did read Lil Wayne recently passed Elvis for number of Hot 100 entries with 109. Not really knowing his music, a quick look on Wiki says he has had just one solo top 75 hit in the UK – “How To Love” yeah, me neither!. He does turn up however on other people’s songs with alarming regularity. I’m thinking quantity over quality. Secondly, well done with Fleetwood Mac, like the question, “Little Lies” wouldn’t be the first guess for anyone. Eventually you would though, start working your way through all 7 (seven) singles from “Tango In The Night”. Thirdly, small world. I was reading a review of “Dazzle Ships” just last week that gives a warm and balanced view track by track. I was and am a fan of OMD, encouraged by a friend who was mad about them. Dazzle took a bit more getting into and certainly was a change from the synth pop of “Architecture and Morality”. Until reading the Wichita article, I didn’t realise quite the cliff they had jumped off. Tricky fourth album syndrome! Anyway, lost fans didn’t have too long to wait for the more radio friendly “Junk Culture” a year later, so no major damage. Their 2010 release “History Of Modern” made almost every hack dig up the phrase “return to form” but I don’t blame any of them. BTW “If You Leave” top single , stacks up against any of their biggest hits, should have been top 5 hit here. Interesting thread here. I think one reason for the UK/US disparity is that they’re measuring different things: sales only vs. some mysterious combination of sales, airplay, and recently streaming. By coincidence I was thinking of this disparity this morning wrt to a certain very famous group of the past 30+ years. Their early career had 3 UK top tens, none of which made the US top 30. They then had 2 back-to-back US #1’s that reached #4 and #6 in the UK. Since then they’ve never had another US #1 but have had 7 UK number ones that peaked at the following positions in the US: 3, 61, 10, 21, didn’t chart (not released? ), 31, and 99. Any guesses? #69. U2? Without internetsearchengining it. #70 Yep. What’s weird is that they haven’t had as many US Top 40 hits as one would think: “only” 15, and only 6 of those hit the top 10. And for such a long running group: their two #1’s were back to back.